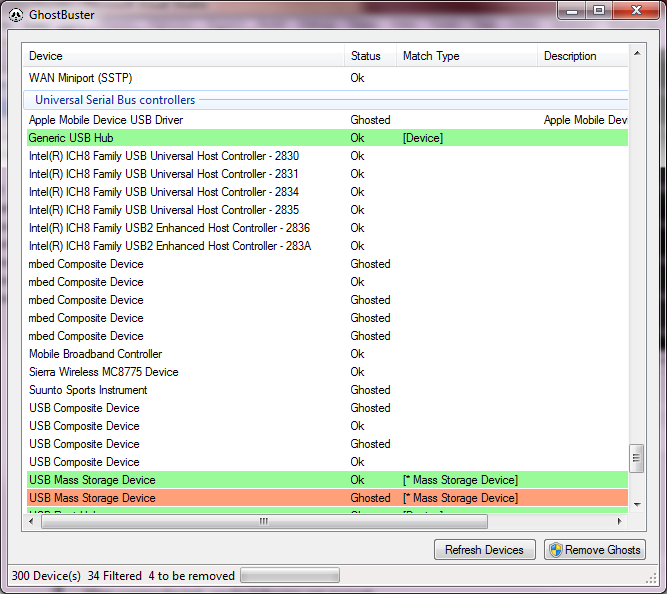 This application enumerates all devices, detects ghosted devices and removes these if they match selectable devices types and/or devices classes with a single mouse-click. Portable, no install required. You can run it from a flash drive! I have some issues syncing sources with TFS (last changeset lacks). Re-uploaded downloads after fixing a small but sometimes show stopping command-line issue (the command-line help message box shows when going elevated). Please update if you encounter this issue. Removed default event log creation to make GhostBuster more portable and solve a policy/access issue. A new command-line option /EVENTLOG has been added to manually create a GhostBuster event log. 710 1,297 Wim van der Vegt <img src="https://www.oldergeeks.com/downloads/gallery/thumbs/GhostBuster1_th.png"border="0"> Jun 07, 2018 - 11:24 1.0.8.0 786KB EXE , out of 5 Votes.